This venue is subject to a seasonal restriction due to nesting birds from the 1st February to the 31st July. Breaking this ban will seriously affect access to the entire area. For more details visitTHE BMC REGIONAL ACCESS DATABASE. Tucked away like a quiet back water, this area has seasonal restriction due to nesting birds. It is however short than the rest of the cliff, but despite this some of the climbs in the area pack quite a punch, from the old school Joe Brown Classic Flytrap to the George Smith’s Modern equivalent The Ultraviolet Exterminator. To the left of Prom is a steep cracked wall above a cave. Start from the base of the slanting chimney. 1. 40m. Climb the slabby left wall of the chimney until it is possible to step on to the steep wall above the overhang. Climb the wall to a flake and use this to reach the vertical crack on the right. Climb the crack to a good stance. 2. 25m Move left for 10 feet and climb a system of leftward trending cracks to the top. Joe Brown, Dave Alcock (1 point),31 March 1968. Climb the overhanging chimney to join and finish up Mordor. Trevor Hodgson and Stevie Haston 1986. Roof Rack E7 6c 17m. The roof above Seal’s Song. From a belay on the outer face of the Seal’s Song fin, go up to the break. Thug across the roof, passing good pegs (average peg near the lip). The crack above is eight grades easier but seems very difficult none the less. Start from the base of Mordor. 1. 20m 6b. Up the left wall of the zawn for 20 feet until opposite a collection of jugs. “Turbo-glide” (jump) across the zawn. Go around the arete in an excellent and overhanging way and belay. 2. 30m 5b. Over the roof at the easy LHS and traverse right to a good crack. Up this, a bit dodgy in places. Stevie Haston and Celia Bull, 5 May 1988. Six White Boomers VS 4c 33m. Start between Mordor and Colditz just right of some black spikes. Climb easily up cracks to a ledge, move steeply left to a left slanting niche and pull over a bulge into the groove above. Follow this and move left at the top to finish up the front of the buttress. Dave Ferguson, James McQueen, 7 May 1994. Escapes up the right arete of the Flytrap zawn. Start 6m right of the arete. Go up the crack to a break, traverse this leftwards onto the arete. Finish up the arete and flake above. This is the first recorded exploration of the Flytrap Cave. Start as for Colditz. 1 30m 4c. Folllow Colditz to the ledge on the arete formed by a horizontal break (possible belay). Go left along the ledge to belay before the large cave. 2 25m 5a. Go to the back of the cave and chimney down to a ledge on top of the chocktone (possible belay). Climb out to the front of the wall at the end of the ledge. Step down left and hand traverse 6m left to a peg in a niche. Surmount the bulge and follow a groove to the top. A classic cave adventure, traversing in to, up, and out of the Flytrap zawn. Pitch 3 is usually damp in places. Abseil to sea-level at the foot of a pinnacle at low to mid-tide (as for Mordor). 1. 12m 4a. 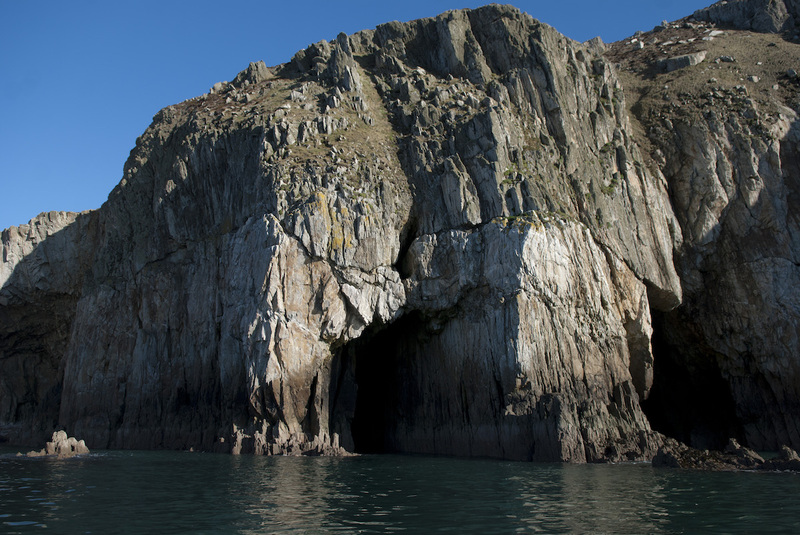 Climb up left on big holes to a ledge and belay (can be reached by abseil at high tide). 2. 25m 5a. From the left hand end of the ledge descend for five metres in to the zawn and make a descending traverse in to the back of the cave to the foot of a black groove. 3. 25m 5b/c. Climb up the groove, often damp, to a traverse line heading out righwards to the head of the cave. Follow the traverse in an increasingly exposed and impressive position, and make wild moves to good holds on the front of the chockstone at the top of the cave (crux). Belay on top of the chockstone. 4. 20m 4b. Climb the righthand wall for 6 metres then traverse right for 6 metres, finishing up a distinct crack. Joe Brown, P. Jewell, D.Cuthbertson 1 pt. aid (16/4/78). 1 4a 12m. Flytrap p1. 2 5c 12m. From the belay ledge climb and up and out diagonally leftwards through the overhang. Pull into the crack above and traverse left to the stance above the huge jammed chockstone at the end of Flytrap p3. 3 5b 25m. Follow Mistaken Identity p3 leftwards to finish up the hanging groove right of the finishing groove of Mistaken Identity. A Lole, B Anderson, 14 Aug 2006. A tough variation on Flytrap based on the obvious hanging niche in the front right side of the Flytrap chockstone roof. Presumably a knowledge of knee bar techniques is useful. 2 25m 5a. Flytrap p2. 3 25m 6b. Head up to the hanging niche and battle through this to good holds in a wide crack. This leads leftwards to the stance above the huge jammed chockstone at the end of Flytrap p3. 4 20m 4b. Flytrap p4. From the tidal ledge climb the juggy fin, make big moves out right in to the bottomless chimney and swim back out towards daylight. Finish up the easy corner. Safe as houses! George Smith and Gwion Hughes 5 May 1988. From halfway up the chimney, take the roof crack out right. Johnny Dawes on-sight solo, 1988. An exceedingly traditional route, starting left of the cave and finishing at a giant chockstone, via the back of the cave. Start round ton the right of 20,000 Leagues Under the Sea. 1 20m 6b. Ascend the initial chimney of The Shadowy World of the Nemotodes, then traverse right to the arête. Gain a slanting crack up and right with difficulty. This widens to a strenuous and awkward vice/pod which in turn leads to the roof of the cave. Belay. 2 10m 5c. Either throw yourself into the sea, or arrange protection and traverse the wall to a point where it is possible to bridge the width of the zawn (or continue along the wall) to the top of the flytrap chockstone. An atmospheric pitch. 3 20m. 4b. Flytrap p4. George Smith, Simon Melia, 2003. Start at the right hand end of the tidal ledge beneath Arachnid. 1 20m 6b. Climb up a V chimney on the left wall of the zawn and arrange protection. Break rightwards into the darkness, spinning round perhaps at some point (?) to find yourself at the Flytrap belay. Good gear and solid, but sharp black rock. All very weird and disorientating. 2 20m. 4b. Flytrap p4. George Smith, Tom Briggs, 2002. Seconded accidentally by T Briggs (with a rest), when the belayer realised that a long lay off (years?) was probably not the best preparation for removing welded in wires whilst undercutting across a roof. From a belay on top of the Flytrap Chockstone, perform one (or more) laps of the chockstone. It is traditional to travel in, down, out and up. Start as for The Shadowy World of the Nemotodes. 1 25m 6b. From the top of the V chimney, head out across the big roof on undercuts and pull into a niche on the lip. Continue up a short wall to the break of Mistaken Identity and reverse this rightwards to the belay. Crispin Waddy and Ben Pritchard April 1988. Climb the groove in the prominent hanging rib above deep water. Solid rock, excellent protection but sustained and pumpy. Why not just solo it? Martin Crook and Diver Dave Kendall 29 July 1987. Start 7 metres to the left of 20,000 Leagues Under the Sea, just right of The Hitcher. Climb up and right to gain a small triangular, then follow slim grooves to overlaps which lead to easier climbing and a break. Finish up the obvious compact headwall. The crux is about 10 metres up, above deep water at high tide and the rest of the route is fine. A very good solo (though a right hand start from 20,000… may be safer). Dai Lampard and Twid (mid 1990’s). Rediscovered as Lola by Crispin Waddy solo around 2001. Very pleasant indeed. Start 20m left of 20 000 Leagues… Climb the obvious crack and groove line on to the slabby wall which leads via cracks to the top. Crispin Waddy on-sight solo, April 1988. This takes the flake crack some 3m left of The Hitcher, starting about 15m right of the highpoint on the traverse from Parliament House Cave. 1 23m. 5b. Climb the steep pink flake to reach good holds and a ledge beneath the less steep wall. Move left and surmount the bulge, climbing gradually left to reach a niche on Route 66, ledge. 2 20m. 4c. Climb the crack above the belay with care to reach the grassy slopes above. Belay on the abseil rope or blocks above. Incorrectly positioned on the topo in the GU Gogarth North guide p218. Between Jug Patrol and Oijee Wall is a left slanting chimney. Start 3 metres left of this. 1 25m 5b. Climb the wall left of the chimney up to a groove. Climb this to an overlap and make steep moves over it to belay on the ledge system of Route 66. 2 20m 4c. Take the slab above on big flakes to a grassy finish. Belay on blocks. Tony Morley, Dave Ferguson, 8 April 1997. Easier than it looks on account of huge hidden jugs. Start 30 yards left of 20 000 Leagues… below a huge bulge of weird rock. Climb up to a large lump then right on jugs through a bulge. Straight up the slabby wall to a large birdy ledge on Route 66. Go up the crack right of the chossy corner (Point Blank). Crispin Waddy, Guy Xavier Percival, March 1988. Start a few metres left of Oijee Wall. 1 25m 5a. Climb a short crack leading up to the left to a semi-detached flake. From the top of the flake make a series of difficult moves to the right to reach a good crack in a shallow groove. Climb this to the ledge of Route 66 and move right to belay. 2 15m 4c. Move right into the corner and climb the obvious crack to the top. J. Brown, T.Peck, Sep 1967. On the wall opposite North Stack Wall there is a blunt rib/arete just after the crux of the traverse in to Flytrap area (about 20 yards left of Oijee Wall). Pitch 2 is best avoided by traversing off right or abseiling. 1 90 ft 5a/b. Climb the rib to a ledge (Route 66), a good pitch. 2 150ft 4b. Continue to the top on dubious rock, an exceptionally bad pitch. Crispin Waddy on-sight solo, Sep 1988. On the big wall opposite North Stack wall. Start in a huge-ish chimney that faces south. Unclear if this is the chimney between Jug Patrol and Oijee Wall or the chimney left of Point Blank. From 7m up this, go right to a crack, which leads to a recess. Continue from the left hand side of this up a crack to the top. May share ground with other routes. C.Waddy on-sight solo, May 1990. The ledge system of Route 66 cuts the cliff at half height. Descend a short gully at the top of the buttress, as for Mordor, and scramble carefully down grass to the start of the traverse line. 1 30m. Follow the ledge system leftwards to belay in a large recess below a steep crack in the centre of the wall (Point Blank). 2 15m. Step down to a narrow ledge and move along this until it disappears under an overhang. Continue traversing for a few feet then climb diagonally left up the steep wall to a grassy bay. 3 35m. Finish up the obvious diagonal break which leads loosely to the top. Joe Brown, Pete Crew, Baz Ingle 20 Feb 1967.